Sd heeft vandaag een nieuwe update uitgebracht van zijn contestlogger. SD sets the standard for fast, simple logging and editing in the major international contests and in dozens of others worldwide. It is intended for single-op unassisted entries, and runs on Windows, from Win95 to Win 10 , and on Linux/Wine – with a console-mode (text) interface. SD supports rig control, serial and parallel keying – and integrates with WinKey to eliminate CW timing issues caused by Windows – the WKUSB kit is recommended. microHAM’s USB CW Keyer offers WinKey and level converters for rig control in a single package. 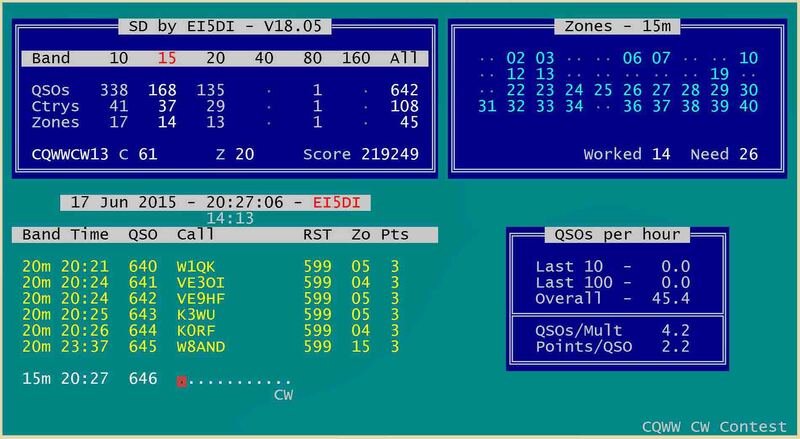 SD offers instant “full-screen” editing of any QSO in your log. All SD’s files, including the log, are ASCII and can be viewed with any text editor. SD is the only contest logger to offer the following features, in real-time, as you type individual callsign characters. There’s no need to touch another key or memorise Ctrl-This or Alt-That. With interal keying (serial or parallel) and PTT enabled, PTT remained ON after leaving keyboard mode. Fixed. Updated the template file to reference RDXC.MLT rather than RUSSIA.MLT. Support is discontinued, although SD may still run on Linux with wine/wineconsole, but this is no longer a consideration for updates. The BORDER command is discontinued.